The Emma Mattress company has introduced a mattress that has had an almost instant impact on the UK market winning numerous quality and satisfaction industry awards which has naturally led to the expansion of their product line to include pillows. We’re seeing a rise in the number of manufacturers making pillows that claim to suit all types of sleepers, but is this true? We’ve completed a full review of the Emma pillow to see how effective it is at improving sleep and whether it lives up to its claims. Emma has created their pillow with one goal in mind which was to create a three-layer pillow that will adjust to allow it to be used by anyone. The first layer is an airgocell foam layer that allows you to sink into the pillow while also providing the correct support for your neck. Beneath this is a cold foam layer which allows you to sleep in any position while still being supported and gives the right level of counter pressure. This layer is also removable which allows you to adjust the height of the pillow. There is a contouring Visco-elastic memory foam layer that distributes the weight from your body effectively over the material giving you a comfortable experience. These layers make it possible for you to choose between two different sides of the pillow. If you decide to pick the comfort side, then this will allow your head to slowly sink into the pillow which will give you a soft feeling. 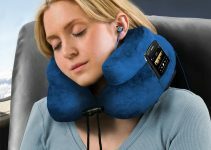 If you choose the supportive side of the pillow, then you will feel the added support on your head and neck which is great if you suffer from constant neck pain as this will help to relieve it. 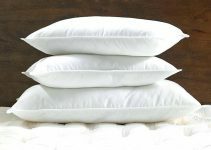 The top cover is made from 98% polyester, and 2% elastane making it breathable and works to regulate the temperature of both your body and the pillow. It ensures that air circulation is at an optimal level stopping yourself from overheating leading to a more substantial amount of REM sleep. The cover is also removable using a high-quality zip and machine washable. The pillow comes in two different sizes of regular (40 X 70 cm) and Super king size (50 x 75cm). Because of the high-quality fillings that are being used, when you sleep, it will give you that cloud-like feeling, but you won’t sink too far into the pillow to the point where it feels uncomfortable or find it difficult to breathe. Naturally, like when you get any new pillow, it can take a few nights to get used to the difference in feeling especially if you need to test several heights. However, once you find your ideal height, any existing pain will begin to reduce, and you'll feel more relaxed when you get into bed. If you're more comfortable, then it will take less time to fall asleep, leading to more hours of sleep each night. Side Sleepers – When you sleep on your side there is a more significant gap between the shoulder and head which needs to be supported throughout. For this reason, all three pillow layers need to be used. Back sleeper - If you sleep on your back then it's recommended to use two out of three layers because you don’t need the highest loft, but then you’re still free to either choose the supportive or softer side of the pillow. Front Sleepers- Stomach sleepers are the hardest to cater for however you can remove all but one of your preferred layers, so the loft is at its lowest to ensure that your spine or neck is not strained. The pillow is supplied with a 100-night sleep trial which gives you an extended period to try out the pillow in the comfort of your own home to see if it’s the right for you. During this time you can try different heights until you find the perfect setting. If in the unlikely event the pillow is just not for you, then you can return it for a no questions asked refund.